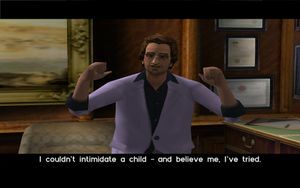 Ken Rosenberg telling Tommy Vercetti about Giorgio Forelli's legal problems. Jury Fury is a mission in Grand Theft Auto: Vice City given to protagonist Tommy Vercetti by lawyer Ken Rosenberg from his office in Washington Beach, Vice City. Tommy drops by Ken's offices in Washington Beach where Ken tells him that the Forelli Family, and in particular Sonny Forelli, is angry that he does not have their money. So, in the meantime, Tommy has to do them a favor. Sonny's cousin, Giorgio, is looking at five years in prison for fraud unless the jury change their mind. Tommy leaves Ken's office and witnesses a golfer accidentally run over a worker with a Glendale, who drops his hammer. Tommy takes the hammer and drives to the first juror (who drives an Admiral), which is located at a high-rise building in Vice Point. Tommy damages the car with the hammer or any weapon until the juror comes out and runs away. Tommy then drives to the second juror's location in Ocean Beach and damages the second juror's vehicle, a Sentinel. The second juror, standing next to the car talking to a woman, attempts to flee but is trapped after being hit by a Spand Express truck. Tommy continues to damage the vehicle until the second juror flees the scene. Sonny Forelli: Hey Tommy, it's Sonny. How's the sun tan? Tommy Vercetti: I ain't got no sun tan. Sonny Forelli: Well, you ain't got my money, either, so I'm wondering to myself, what are you doing? So, tell me, Tommy, what are you doing? Tommy Vercetti: I'm looking for the money, Sonny. Don't worry. Sonny Forelli: I am worrying, Tommy, that's my style, because I seem to have this problem in my life with unreliable people. Don't be an unreliable person, Tommy, please. Do us both a favor. I'm looking forward to hearing from you. The reward for completing the mission is $400. The missions Riot for Ken Rosenberg and Road Kill for Mr. Black are unlocked. The Body Armor is now available to purchase at all three Ammu-Nation stores. The player can keep the hammers that have been obtained during the mission. This mission is one of only two missions where the player can obtain the Spand Express Truck. The jurors' Admiral and Sentinel are heavy vehicles. The car will feel "heavier" and will lose less momentum when colliding into dynamic objects. However, they are more susceptible to damage and will only take two or three hits before they start smoking or even exploding. This property cannot be saved in a garage. Even though the game's instructions are to "smash up" the juror's cars, the player can instead opt to shoot the cars or use explosives. The game will treat it as if the player actually smashed up the cars, and the mission will proceed normally. If the player attempts to blow up the cars with explosives they will set on fire as usual, but when the cutscene begins the fire will disappear and the car will not explode. The juror, inside his car, shortly after colliding with a Spand Express van. Tommy Vercetti damaging one of the jurors car with a hammer. One of the jurors running away as Tommy Vercetti reminds him that Giorgio Forelli is innocent. Tommy Vercetti damaging one of the jurors car. Tommy Vercetti reminding one of the jurors that Giorgio Forelli is innocent. This page was last modified on 1 May 2015, at 22:37.